I’ll catch some heat for this one. If you think the vitriol is heated between Sanders and Clinton, check out what their supporters are hurling at each other? Many are pledging they won’t support the other candidate if he or she becomes the nominee. They seriously need to calm down before we have a President Trump, President Cruz, or even a President Ryan. Bernie Sanders promised not to go negative. A few days ago he said Hillary Clinton is not qualified to be president. That’s pretty negative. On Friday he stated that she was qaulified. Where did this come from? Before all this, Clinton gave an interview where she was asked if Sanders was qualified. She never stated he was, but didn’t say he wasn’t. That ticked Sanders off. You can hate Hillary, believe she’s the spawn of Satan, that the FBI is going to send her to prison, whatever and that’s fine. But she’s the most qualified candidate running for president. She was a United States senator twice elected for the second largest state in the country. She was Secretary of State. She’s pretty qualified. She also eventually stated that Sanders is qualified for president. The other part of this is Sanders’ statement that you need a token to get on the Subway. What? I have never been on the NYC subway but I know they don’t use tokens. I would just assume they wouldn’t because I’ve been on the D.C. metro thousands of times and they haven’t used tokens since before 1998 when I first rode them. Hillary also had a problem swiping her card to get on the Subway. Let’s face facts here. None of the candidates are frequent users of public transportation. They probably don’t even drive themselves, except for Sanders. 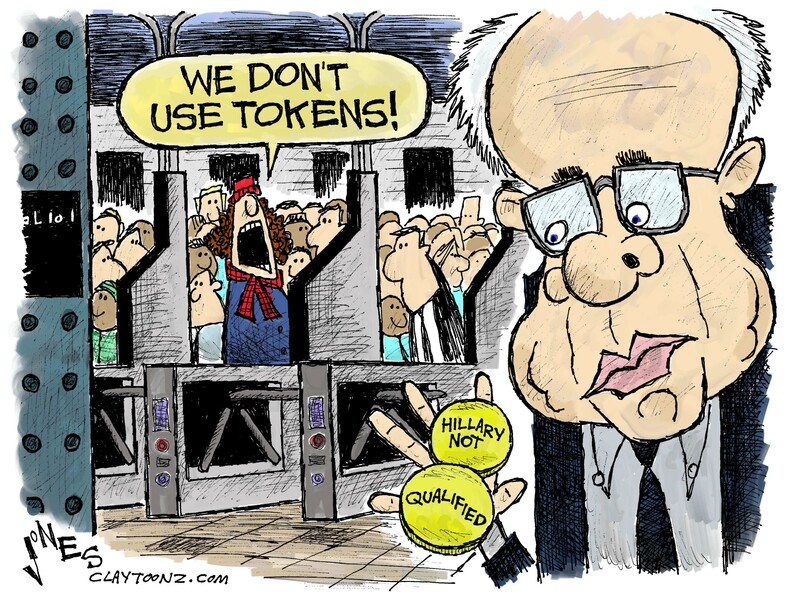 I didn’t intend to throw a lot of art into this cartoon but I had to put Bernie in the foreground so the text on the tokens are readable. After I was done penciling I realized I had the stalls backwards. The entry was facing away from Sanders. I almost let it slide but it bothered me enough to know it was really gonna annoy me after it was published. There would be that one New Yorker to notice and scream at me. Correction: I meant to double check before I published but forgot. New York is the FOURTH largest state, not the second. It goes in order of California, Texas, Florida and then New York. Florida and New York do have the same number of electoral votes.